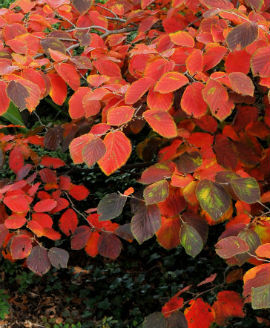 Flaming Fall Foliage in the Landscape | Faddegon's Nursery, Inc. I just walked out into the nursery and was ‘blinded’ by the brilliant color of the Witch Hazels (Hamamelis). These deciduous flowering shrubs have lovely winter and spring flowers and then go for an encore in fall with brilliant red, orange and yellow leaves. Witch Hazel enjoys full sun to part shade and grow in Zones 5 – 8. The spicy-scented yellow or orangey-red flowers appear before the plant leafs out, similar to Forsythia. Other flowering shrubs that contribute flashy fall foliage are Summersweet (Clethra – yellow leaves); Bottlebrush (Fothergilla – yellow, orange, red leaves); Sweetspire (Itea – red leaves); Oak leaf Hydrangea (Hydrangea quercifolia – burgundy-red leaves); and Chokeberry (Aronia – red leaves).